You can create a new JMP table that is a transposed version of the active data table. The columns of the active table are the rows of the new table, and its rows are the new table’s columns. Select the columns to be transposed. Specify a “label” column, from which the new columns get their names (optional). 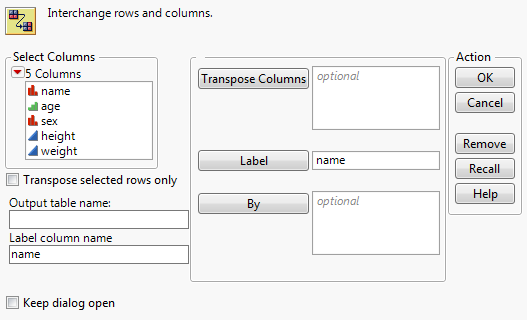 Specify “by” columns, which tells JMP to transpose data within groups (optional). Open a data table that contains the rows and columns that you want to transpose. Highlight the column name(s) you want to transpose in the Select Columns box on the left. (Optional) Customize your transposed table further using the additional options. Contains options to search and filter through columns. See Column Filter Menu in Get Started. Transposes only rows that are currently highlighted in the active table. (Optional) Specifies the name of the subset table. (Applicable only if you have specified a Label column.) Specifies an alternative name for the Label column. Otherwise, the default column name is Label. Keeps the Transpose window open after you click OK. Adds the columns that you want to transpose. Highlight a column from the Select Columns box on the left. Click Label. The column name appears in the Label box. The default column name is Label. You can specify an alternative name for the column using the Label column name option. Only one column is created for each distinct value in the label column. Therefore, if there are duplicate values in the label column, JMP creates only one column for the duplicated value using the value from the last duplicated row. Highlight the column name(s) in the Select Columns box whose values you want to see as a group. Table 5.1 describes the rules that apply to transposing. The new table contains one column that lists those column names. Its values become the column names in the transposed table. JMP automatically inserts the label column into the Label box when the window appears. You can remove this column if you do not want it to appear. The column names in the transposed table are Row 1, Row 2, …, Row n where n is the number of rows in the original table.